- our theme is " Sew Special", option is to use stitching. You can use any stamp, but sorry no digis allowed. Stitching with machine; self crocheted flower; MD leaves; pearly pin; lace; organza. N not just one: ABC Ch. GORgeous! LOve your colours and this is one cute image too. What a cute creation Mervi. Love this stamp, and I love the sketch! A beautifully coloured image Mervi and such a pretty colour palette. So pretty Mervi and I love the flower. 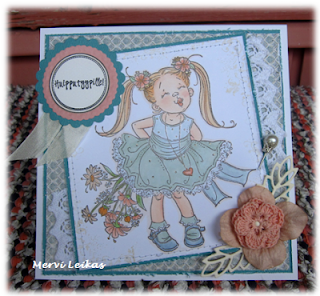 Such a pretty girly card Mervi. I love crochet flower and the Mo Manning image, she has plenty of attitude. aw, such a sweet card, mervi! i love that adorable image and how you've coordinated everything beautifully. Love this image and your the cute flower! Thank you for playing with us at ABC Challenge! Good luck and I hope we see more of your lovely work in the future! 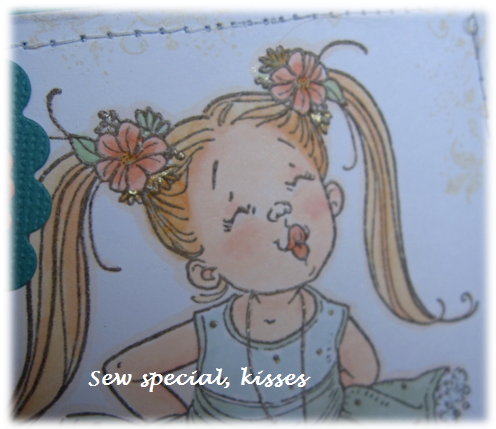 Love the colours and colouring on this - great skills, and a really pretty card! 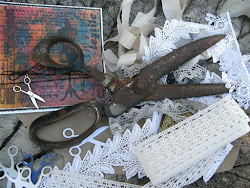 Thanks for playing along with us at Our Creative Corner. Thanks for sharing her with us at Totally Papercrafts this week. Aww what a cutie, thanks for joining us at Polkadoodles this week. Great card! Your image is cute! Thank you for joining us on the Wags 'n Whiskers Anything Goes Challenge!